I have a feeling that a lot of people are going to pin this loss on Geoff Geary, who earned his second loss in as many games as the Astros fell, 4-3, to the Cincinnati Reds. I don’t think it’s fair to do that. Geary did not pitch well, giving up a walk and a hit to the only two batters he faced, but it was one of the few moves Cecil Cooper has made this season that I liked. After last night’s loss, Geary needed his confidence back. You can’t leave him hanging around the bullpen thinking about it. You have to give him the chance to succeed. Of course, that’s sounder logic if he doesn’t then turn around and fail. I suspect we’ll also be hearing a lot about Hunter Pence striking out looking to end the eighth inning with the bases loaded. Also not entirely fair. 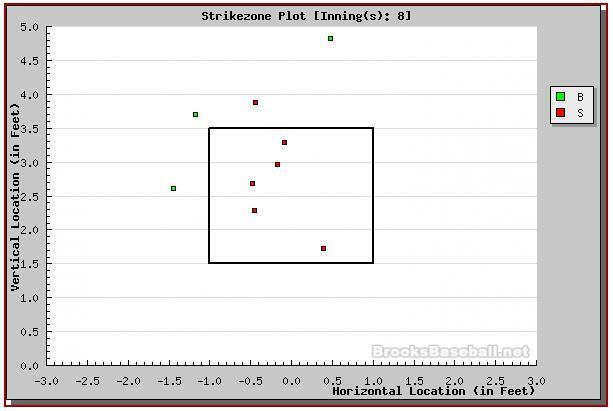 As you can see from the Gameday data below, this was a very smart strikeout by Arthur Rhodes. He stayed inside, letting Hunter foul off tough fastball after tough fastball, and then put a 93mph fastball over the outside of the plate. That’s tough. You know they’ve been staying inside. You know the outside pitch is coming. You just don’t know when. And the more they throw high and tight, the more you’re fighting for your own survival. And it froze him when they threw the pitch he knew was coming. Of course Pence knew it was coming. Everyone knew it was coming. We just didn’t know when. Looks like a very legitimate call to me. I really think it was just an excellent pitch called by Ramon Hernandez and thrown by Arthur Rhodes. They had Pence locked inside, mostly up, and then went down and away. Good call. The Astros struggled again at the plate tonight. Despite 11 hits, once again none of them came with runners in scoring position. As a team, they were 0-for-5 with RISP. One of their three runs came on one of the biggest mistake pitches I’ve ever seen… a curveball over the heart of the plate to a lefty-hitting Lance Berkman. Gone. 436 feet, the longest home run at Minute Maid Park yet this year, according to Hit Tracker. No, I think three very specific things (other than the inexplicable inability to hit with RISP) spoiled this game for Houston. 1) Ivan Rodriguez. He may be working very well with Wandy Rodriguez (or at least that’s what the PR department tells us), but his preparation for this game was abysmal. There was a string where he called seven consecutive changeups from Mike Hampton (who pitched great, by the way, and was probably pulled too early, but that’s understandable with his history). I should not know the Reds hitters better than he does, and tonight I felt that I did. He called three consecutive sliders to Joey Votto, who loves sliders, and I the only reason the first one didn’t end up out of the park is probably because Votto was as surprised as I was to see a meaty slider breaking across the plate. As it was, thankfully, he only got a two-run, game-winning double when Pudge decided to follow a chase pitch with a fastball middle-in with Tim Byrdak on the mound, whose fastball is routinely around 90mph. If Pudge is going to struggle at the plate, he’d darn well better prepare better behind it. 2) Cecil Cooper. Cecil, Cecil, Cecil. The Astros, down 4-3, pinch-hit Jason Michaels to lead off the eighth inning. He promptly doubled to center field, giving us the dreaded RISP with no outs (I wonder if we’d have done better if he’d just stayed at first?) Then, rather than ask leadoff hitter Kazuo Matsui to simply hit a grounder to the right side, he ordered a sacrifice hit. Like a good little soldier, Matsui did just that. He bunted Michaels to third, sacrificing an out in the process. Now, the problem with that is that we now have a runner at third with one out. This isn’t a double-play situation – almost any ball hit to the right side advances the runner, and gives you the chance for runners at the corners with no outs with Miguel Tejada, Berkman, Carlos Lee, and Hunter Pence due up. Instead, you’ve now sacrificed an out, and have a man on third with one out. Tejada draws a walk, putting the struggling Berkman at the plate with a double-play situation. He gets greedy, tries to elevate the first pitch he sees, and pops out to right field. No sacrifice fly, and now because we sacrificed Michaels over, there are two outs. Pence actually fought a hell of a fight after Lee got walked, but couldn’t overcome the sloppy managing. 3) Still Cecil Cooper. Miguel Tejada is not a #2 hitter, and here’s why: Since 2002, only once has Miguel Tejada not been among the top three hitters at grounding into double plays. 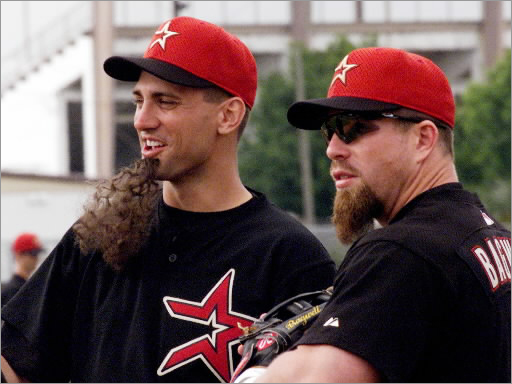 That year was 2003, when coincidentally he also had his lowest BA, OBP, and SLG in that time. In other words, only one time was he not in the top three, and that was the year he was just failing to make contact at all. We lack an ideal #2 hitter, but Geoff Blum is .297/.366/.351 so far this season. He’s getting on base and doing it with a 22.9 GB%, which is great for staying out of double plays. Compare that to Tejada, who has a 48.8 GB% so far in this young season. Matsui opened the sixth inning with a single, but was promptly erased on – surprise, surprise – a Tejada GIDP. 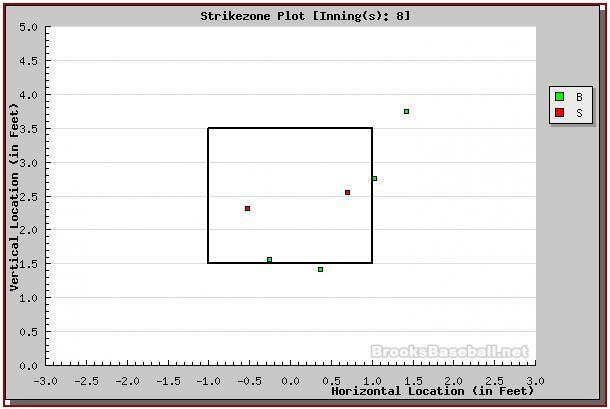 Because of this, Berkman hit a solo homerun, rather than a two-run or three-run shot. We lost the game by one run. This one was a heartbreaker, and a lot of it came down to Cecil Cooper’s ineptitude. Which ordinarily, I wouldn’t harp on this much, but on the heels of the announcement that he had been re-signed through 2010, it makes it sting that much more. Of course, that doesn’t mean that Cooper won’t be fired. Phil Garner was released with a year and a half left on his contract. The announcement seemed more like a way to get Cooper some respect from the veteran players than it did to reward him for anything in particular. My solution? Tim Bogar. I was having this discussion yesterday, and all the pieces fell into place for me. and was Manager of the Year there. bloodlines. He was in our system as a player and as a manager. He also knows the team pretty well – he played with Mike Hampton and Lance Berkman in Houston, and he’s already managed guys like Felipe Paulino, J.R. Towles, and Brad James in Greeneville and Lexington.